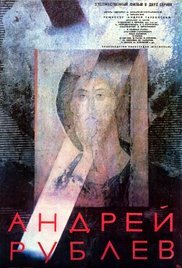 Andrei Rublev is divided into eight chapters, with a prologue and an epilogue only loosely related to the main film. The main film charts the life of the great icon painter through several episodes of his life. The background is 15th century Russia, a turbulent period characterized by fighting between rival princes and the Tatar invasions. The film's prologue shows the preparations for a hot air balloon ride. The balloon is tethered to the spire of a church next to a river, with a man named Yefim (Nikolay Glazkov) attempting to make the flight by use of a harness roped beneath the balloon. At the very moment of his attempt an ignorant mob arrive from the river and attempt to thwart the flight, putting a firebrand into the face of one of the men on the ground assisting Yefim. In spite of this the balloon is successfully released and Yefim is overwhelmed and delighted by the view from above and the sensation of flying, but he can not prevent a crash landing shortly after. He is the first of several creative characters, representing the daring escapist, whose hopes are easily crushed. After the crash, a horse is seen rolling on its back by a pond, a symbol of life – one of many horses in the movie. Read more on Wikipedia.